This lovely bridge in Venice crosses the Rio di San Felice in Cannaregio. The Ponte Chiodo has no railings between it and the canal, so it seems to float ethereally above the water. This painting is a very classic value pattern of dark surrounding light. The warm colors down the canal pull you into the picture. The cool darks gives a foundation to the painting and the cool and warm colors of the bridge quite literally bridge the cools and darks, pulling the viewer's eye into the painting. With a painting this colorful and this much action, it's easiest to keep a very simple value and color pattern. Too complicated would be distracting. In the spirit of full disclosure, the painting took me an hour and a half of actual painting time, though the video is edited down to 27 minutes. I painted it in 2 sessions. It's nice to know how long paintings really take to paint! The photo is lovely, but a bit dull. I love the lines of the gorgeous bridge seeming to float in midair. The lack of railing really adds to the beauty. I carefully plan my value pattern before I put a brush on the paper. I start out with a basic wash of quinacridone gold. I like to have one color tying the entire painting together. Even in the cool areas, I still want the lovely golden light glowing under the cool blues and purples. This isn't a given - sometimes I don't want to have the gold underneath to avoid greens and make it absolutely cool. Make certain to leave lots of white paper! While the gold is still very wet, I start dropping in a few colors. I want to get some darks in the painting. Remember that watercolor paint always dries much lighter than you paint it! I'm staying with fairly warm tones in this wash. I still am painting the warm glow of Venice stucco and light under everything. 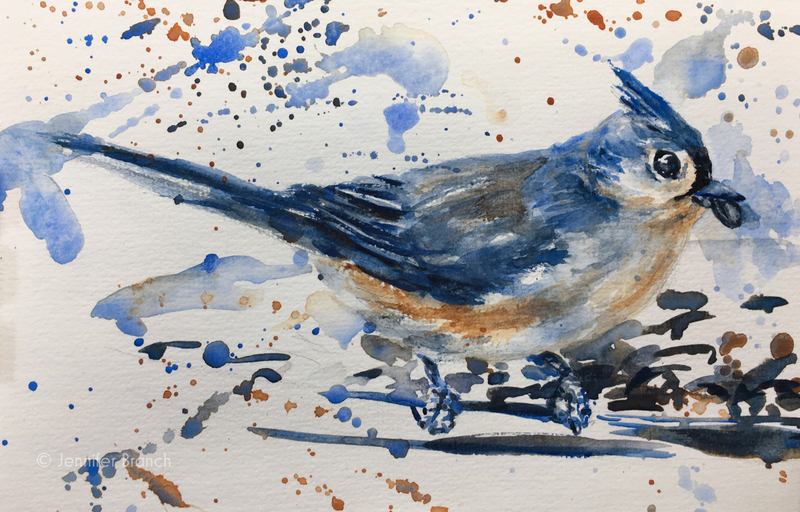 Even ultramarine blue is warmed up with ultramarine pink and pthalo green. If you don't pull the background into the objects, it looks cutout, photoshopped onto the background. The real shapes are the value patterns - not the objects! "There is something so different in Venice from any other place in the world, that you leave at once all accustomed habits and everyday sights to enter an enchanted garden. " Everything is starting to dry, so I wet it with splattered clean water! Splattering clean water is a good way to loosen up a painting. Watercolor painting is hard but it's not serious. So don't treat it to preciously, your painting won't thank you! Edges blur naturally when water flows, unlike oil where you have to force edges to blur with a brush or knife. Oil painting is all about complete control of the painting. 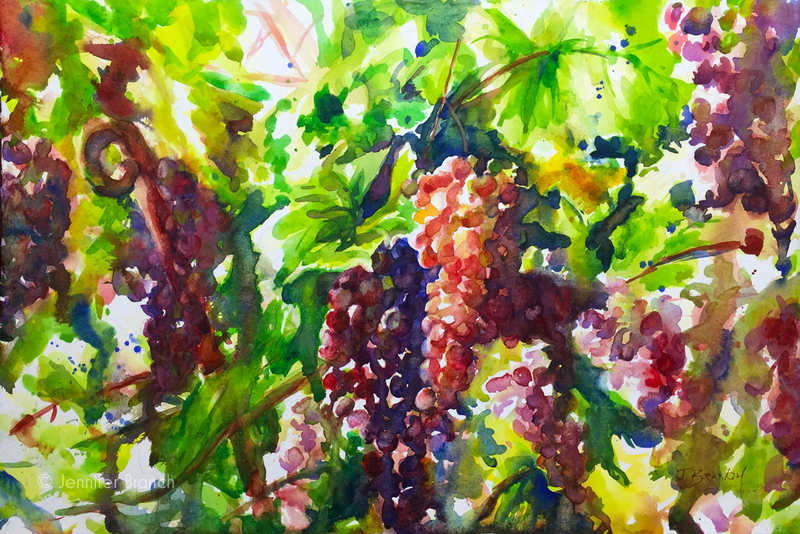 Watercolor painting is about recognizing happy accidents! So when you see those wet edges feathering out in a very un-stuccoey line, realize that texture underneath might be just what gives you a ancient mottled stucco in the next layer. Don't forget to just dash in the bridge bricks. Not too much detail since detail would distract from where I want my viewer's eye to go. Now it's starting to look like something! This is always a really fun stage, when I've finished the first wash that has to mostly dry before I add anything else. If I hadn't waited for that gold to dry, I wouldn't have been able to get the lovely scratchy dry brush on the far pink buildings. Without that dry brush, not only do I miss the stucco texture, but it doesn't have the sparkle of Venice. I'm building up to have the bridge light against a dark background, so that's a bit of negative painting. Even these extreme ultramarine blue and burnt sienna darks will dry much much lighter. Layer them on, but use lots of paint and lots of water! Just a few dashes next to suggest doorways and windows. It doesn't take much so I don't want to spoil the misty Venice light with fussy details. Now the watercolor has dried and look at the difference. Much much duller. Don't worry, I'll change that! I'm just dashing in little bits of detail around the painting. I add a bit of shadows to make the white marble of the bridge stand out. I take advantage of the dry paper to add roof beams and shadows to the buildings. And I dash some ultramarine under the bridge since it's still not dark enough! A few more details are added here, but the real difference is I took the painting from a very warm painting to a warm surrounded by cool colors painting. The cool blues of the bridge shadow and the cool blue of the left building lead the viewer into the painting. Sometimes I might blur the edge of a strong line leading out, like this building. Sometimes I don't. It's best to wait until the end so you can really see it clearly! 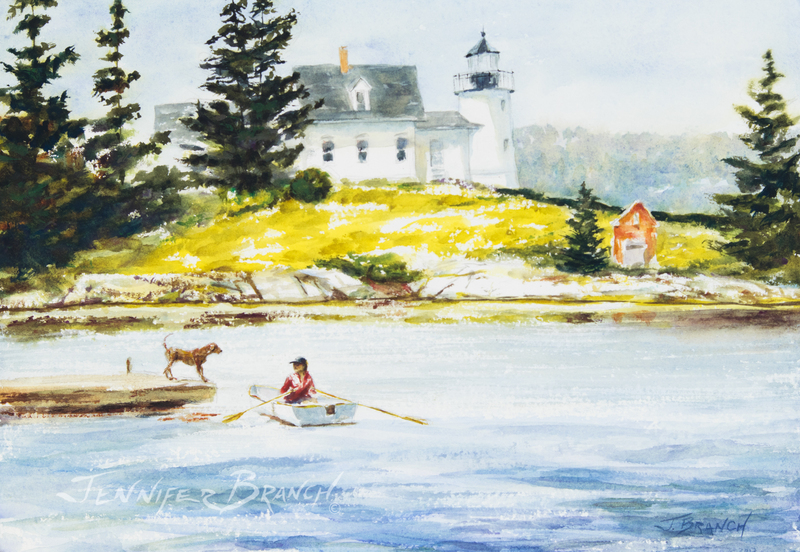 But this painting would not have worked without that cool building framing the warm and light center of interest. 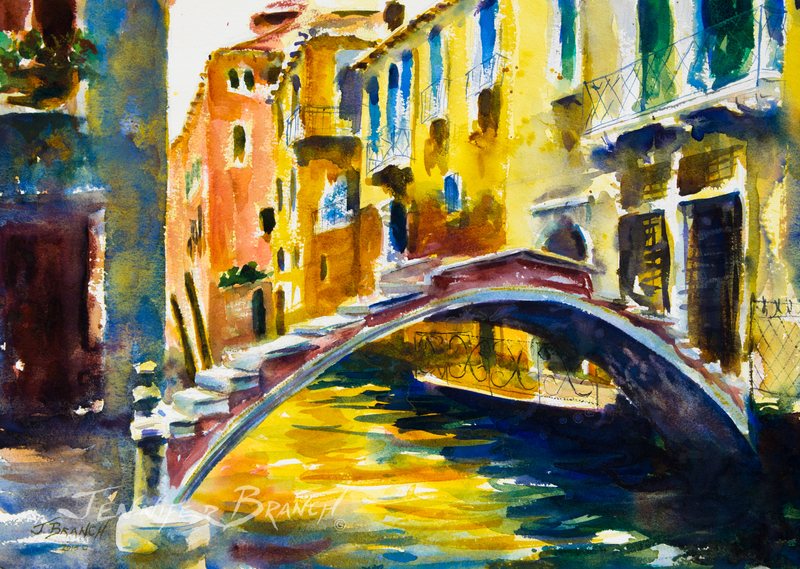 To purchase Painting a Venice Bridge original watercolor painting, please click! Painting a Venice Bridge Final Watercolor Painting! All that's left is to add some railings with a rigger and a bit more detail. I keep the detail very loose and dry brush, just skimming the paper's texture. I need the detail since part of the charm of Venice is the lovely iron and stonework, but too much detail would be a distraction. Instead, I'm adding detail pointing toward my center of interest with the angles of the railings. I love the light reflecting on the underside of the bridge. The light reflecting under things and on building walls is really what Venice is all about. The reflecting glowing light on surrounding everything. Light dapples the buildings and the shadows and makes the entire city luminous. The water reflected light patterns make you feel almost underwater. This watercolor painting turned out very well! I like the cool surrounding warm lights. A very classic composition because it works well. It's always important to consider your value and color temperature composition from the beginning of any painting. 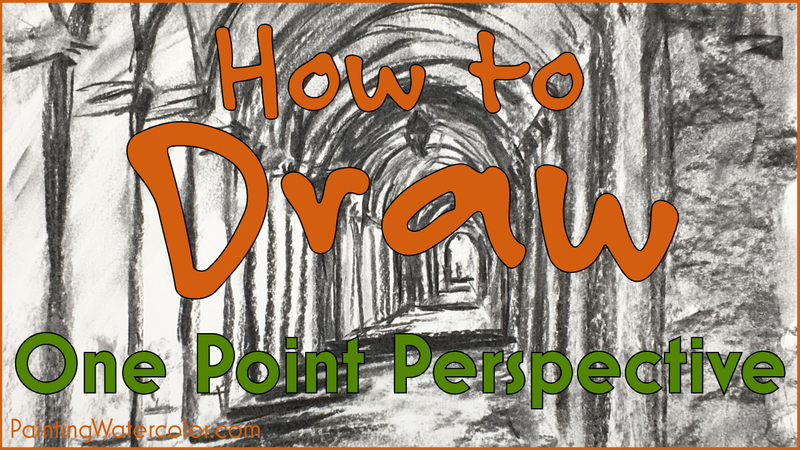 Everything that you paint should direct your viewer's eyes along the path you want it to go on. You want to direct your viewer to your center of interest and then hold them there. That's why you don't want too much detail or value contrast away from your center of interest. I love the glowing rich color of this painting and the white sparks of light reflections dappling the stucco walls. This is a lovely view of a classic Venice bridge!